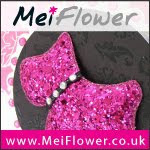 I came across a couple of cards in my Meiflower folder that I realised I hadn't yet blogged, so here they are. 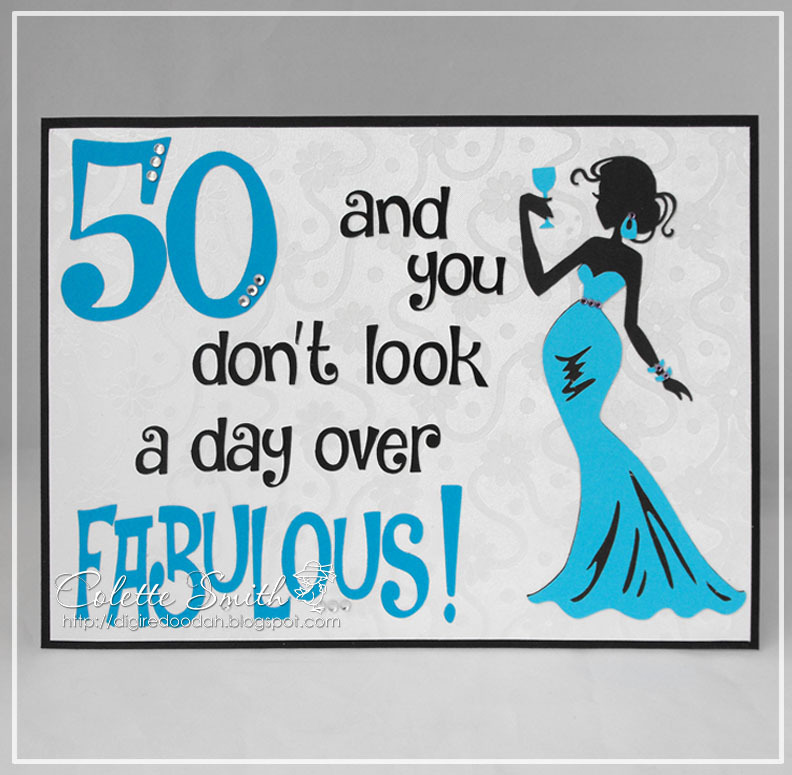 The first one was for my friends 50th birthday, everything was cut out on my Silhouette machine, I added a little detail to the numbers, dress and jewellery with some Meiflower stick on gems. The other two are Christmas cards from last year. I found the bubble wreath digi stamp on the internet for free from Blackberry Jelly HERE, I re-sized it so that the rings were the right size for the gems and after printing, added black glitter to the outline. I cut it out leaving a border, added the stick on gems and then fixed it to the card front with foam pads. For this card - after adding some gorgeous red gingham Meiflower ribbon and a big bow across the front, from white card I cut out three fishtail banners, big enough to fit my die-cut letters, then using wire cutters, I removed the centre bar from an oval diamante buckle, which then became the O in Joy. 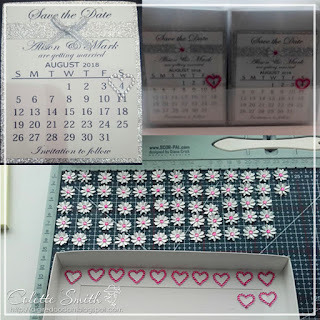 ...does it take to make 60 little heart outlines?, it takes 1200 that's how many, and I should know as I have recently made 60 save the date fridge magnets for my best friends daughter and each had a little gem heart encircling the date. I couldn't find ready made hearts in the colour and size required so I punched 60 hearts from acetate and then proceeded to outline each one with twenty 2mm cerise pink gems, it took a while let me tell you. 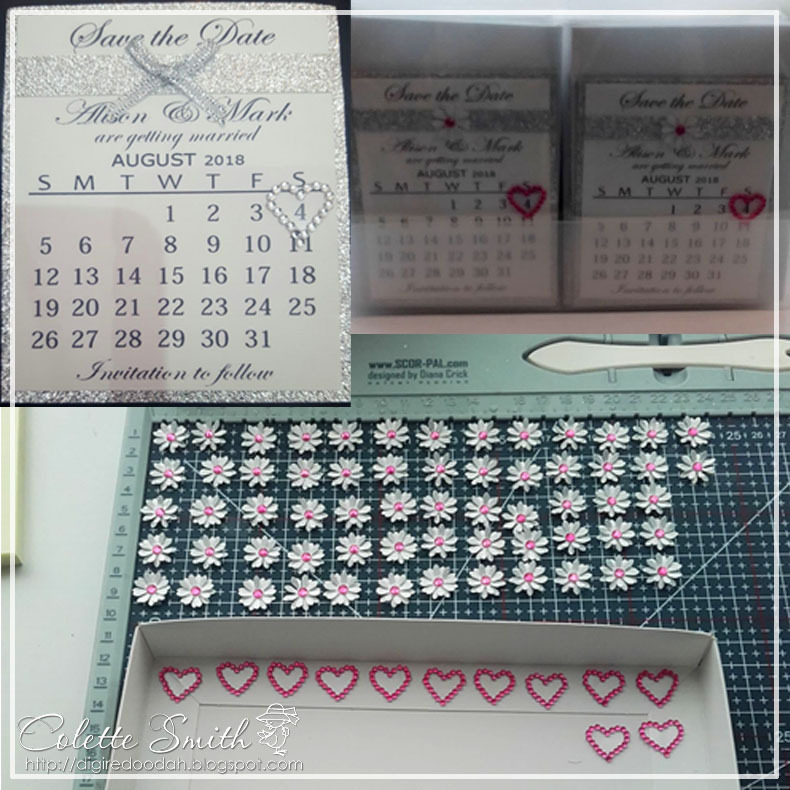 When I made the sample, the colour scheme hadn't been chosen, but once the decision was made I got busy and spent a couple of weeks, printing, cutting, sticking and making daisies and hearts. The photos are off my phone so are not brilliant, but we have - top left - the original sample, across the bottom are all the daisies punched out and layered up and the start of the hearts production line ( I punched out and then gemmed 12 at a time, to give me a break from the monotony of getting all the little gems positioned correctly around the heart). In the top right corner you can see all the magnets finished, packaged up and ready to go. I have one stuck to my fridge as we speak. Only the day and night invitations, order of service, table plan, place cards etc., to do now! A big thank you to Meiflower for supplying me with all those barbie pink gems, they were a perfect match to the colour Alison is having.